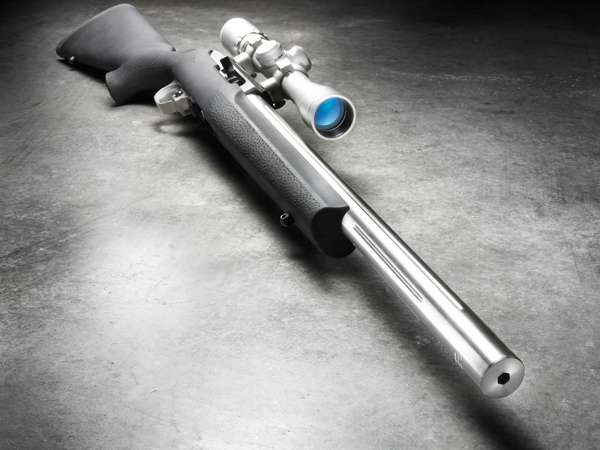 Shown here, our silenced integral 10/22 built on a standard model 10/22 platform with a TBA Suppressors magnetic bolt lock device. 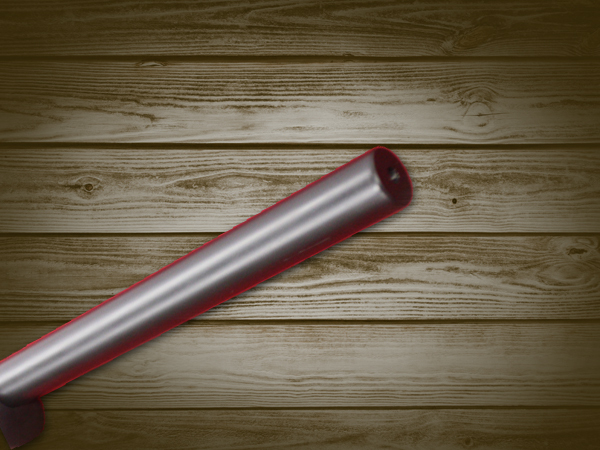 This model utilizes the same simple take down features as the other silencers in our rim-fire line. Our design utilizes a 16.25" barrel that has been re-crowned with an 11 degree target crown and the tube is removable for cleaning. 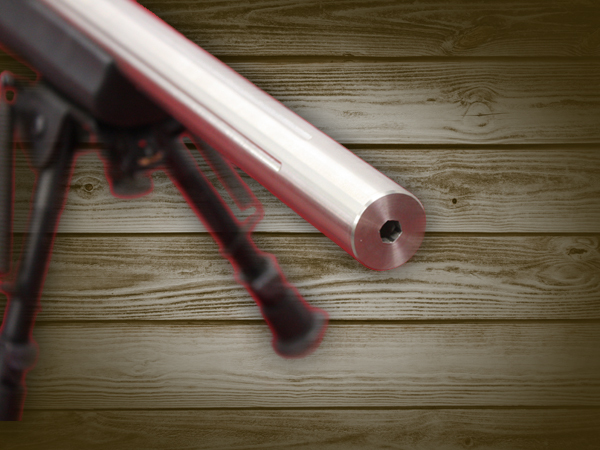 The barrel is ported to utilize high velocity ammunition while keeping the bullet speed just below subsonic. We send a chronograph sheet with every gun built listing the average speeds with 3 different ammunition choices. 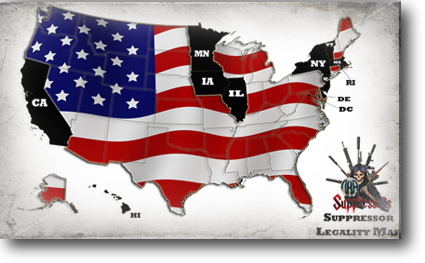 For those who have specific requirements we have made many custom applications in SBR configuration that require an additional $200.00 NFA tax stamp. Photos of these can be seen in our custom photo gallery. 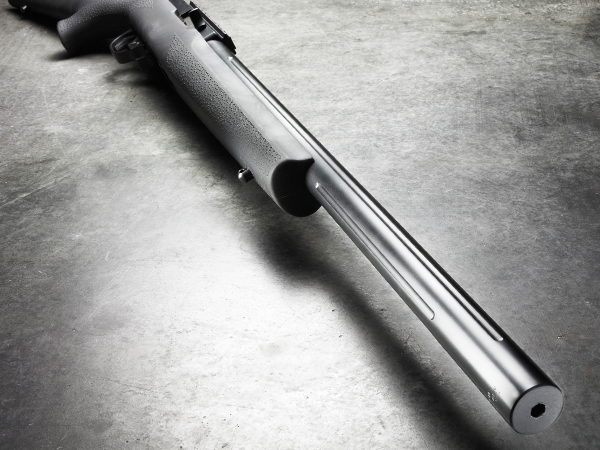 For shooters who demand the utmost in accuracy we suggest an aftermarket barrel that is machined and installed at no additional labor to the customer. 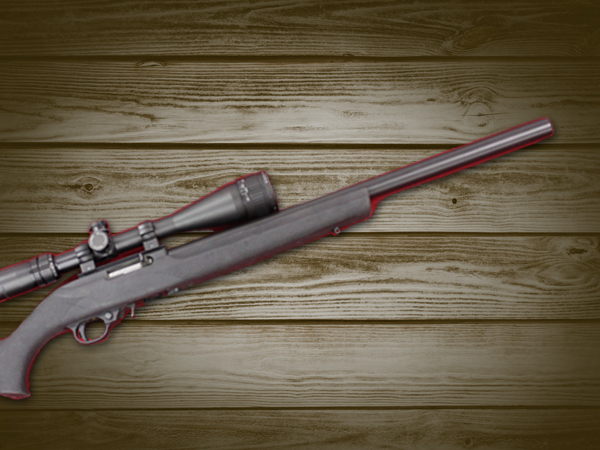 This integral model can be built on any type of semi automatic or bolt-action model you prefer. All of our competitors reduce the barrel length to overcompensate for poor engineering and ultimately this leads to very slow bullet velocity and poor accuracy. Please visit our Shop Services and to see examples of a few of the "sealed" units with tiny barrels we have fixed because the original manufacturers would not repair them. The baffle stack and the tube are removable for cleaning with simple hand tools. A ¼" allen wrench removes the end cap and the 6 baffles are then removed. Next a 5/8" socket removes the machined barrel stabilizer. These pistols will shoot high velocity ammunition and have been modified to reduce high velocity ammunition to 1000 fps and are quieter than an air rifle. If you would like a longer or shorter tube or barrel we will be glad to do this based on your needs. We will install the integral suppressor on your firearm or sell you one at wholesale price with the purchase of the suppressor. If you don't want a Ruger, this model suppressor can be installed on any type of host firearm you prefer. Your Price is for the suppressor only. Interested in getting the gun as well? Ask about purchasing a gun/suppressor combo. Why is the barrel ported? The barrel is ported so that the majority of bulk high velocity ammunition will be 1000 fps. Most bulk ammunition chronographs between 25 and 110 fps which make it challenging to offer one model that works great with everything. CCI ammunition is the most consistent based on our testing and it only varies 2-15 fps making it the ideal choice for the Sicario. The porting holes are very small which allow CCI standard velocity to still reliably function. Can the porting be eliminated? Why is there 3 cuts on the end of the barrel? Integrals have always been difficult to disassemble and assemble. Mainly, during assembly, trying to get the barrel nut screwed on inside of the tube and on the barrel at the same time. The unique design of our Monocore has the threads relieved on the inside of the monocore threads so that, much like the popular 3 lug mounting systems, you can drop the core in the tube directly over the relief portion on the barrel threads, find the sweet spot, and install it effortlessly. Do you recrown the barrel? We crown the barrel to an 11 degree target crown which enhances the accuracy. What threads are on the barrel and the monocore? 1/2 x 28 tpi 2A threads. All of our threads are checked with factory calibrated Go and NOGO gauges. Do you shorten the factory barrel? There are two options for this model. The 20” model retains the original 16” barrel. The 16” model has a barrel that is shortened to 12”. Can I buy just the upper receiver and Sicario silencer from TBA? We do not offer barreled assemblies in this model as the barrels on the Americans are screwed in to the receiver and correctly head spaced at the factory. You can send your gun in and we can build the silencer on your host weapon. 112 db sound signature which is 1db louder than the firing pin hitting an empty chamber. Stainless 37.8, with SS baffles 39.5 oz. Mild steel 37.8 with SS baffles 39.5 oz. Aluminum: 28.4oz with SS baffles 31.4 oz.